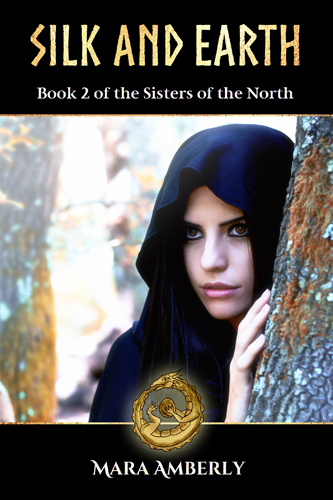 I’ve most-recently been working on Silk and Earth (Book 2 of the Sisters of the North), which is the follow up to Fire and Gold. It’s now available on pre-order from Amazon with a publication date of January 30, 2018 (which you may not know is my birthday). Sisters Cassia and Alexa have found safety in the mountain city of Kelbani, away from the cultists known as the Nemorans, or Warriors of the Dusk, who slaughtered many of their Order. Manses in the cultists’ power have the potential to wipe out all life on Maeridea and their intentions are as dark as the future, should the Sisters of Destiny not intervene. Knowing they must reclaim the manses and confront the enemy, many of the Sisters including Cassia and Alexa – joined by their roguish friend Knave – go in search of them. Not knowing what awaits them, they must take a chance – whether on fate or mere luck, for everyone’s sake. Meanwhile, back on the King’s Island near Kalle, Governor Cerus Arani senses shadows of danger lurking in the King’s court. Suspecting a plot against King Merrion and his forces, Cerus prepares himself as he anticipates trouble is coming. I know I’ve kept my readers waiting on this one so I hope you enjoy it when you read it. It will be available on Kindle Unlimited as well when it becomes available in January. I finally have my new site ready to go, so I’ll be forwarding my web address to this one shortly. I hope you like my web site and I apologize for how quiet I’ve been on social media lately. My projects (and life in general) have been keeping me busy. I’ll be adding more content to this site as time goes on and updating it with news about my books. I have a few books in the works right now and I’ve almost finished Silk and Earth, which is the second book of the Sisters of the North series. I’m aiming for a January 2018 release date in order to allow time for editing.